For the first time since the Ellis Thomas Downs opened to the public before thousands of fans on August Tuesday in 1998, there was no annual August Festival Horse Racing, after a Tropical Wave dropped 17 inches of rain in 17 hours, drenching the territory Aug 7 into Aug 8. 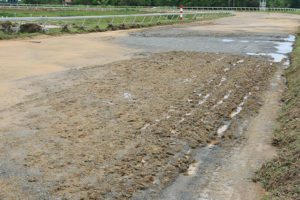 The heavy rains severely damaged the track’s running surface particularly in the area about 70 yards before the finish line, after a blocked ghut between the the grand stands and the track overflowed and eroded the running surface. All the sand at the entrance to the running surface from the padlock area, had eroded, with numerous groves exposing the base material. Among several horse owners who came across from St. Thomas for the races was Louie Donastorg who came with his three horses—Gottcha Blessings, My Running Mate and El Indultado. The goal he said, was to go three for three. While he was ‘looking to go with everything,’ he said they have to respect Mother Nature, because no matter that they do or how they prepare, she has her own thing to do. Before the rains came, Donastorg said the track was in prime condition. He said BVI officials prepared as much as they could when they heard rains were coming by sealing the track. BVI Horse Racing Association President Patsy Lake stopped by the track as the St. Thomas owners were preparing their horses to head to the barge for their return trip. The track she said has damage to it, some in more areas than others. Lake said they were ‘looking at the possibility’ of running on the Sunday Aug 13, but that possibly evaporated when the St. Thomas horsemen left. “We’ll have to do the repairs to the track and try to see when we can do the races,” Lake stated. Lake is not sure how long it will take for the track to be repaired as they’ll need government’s assistance. 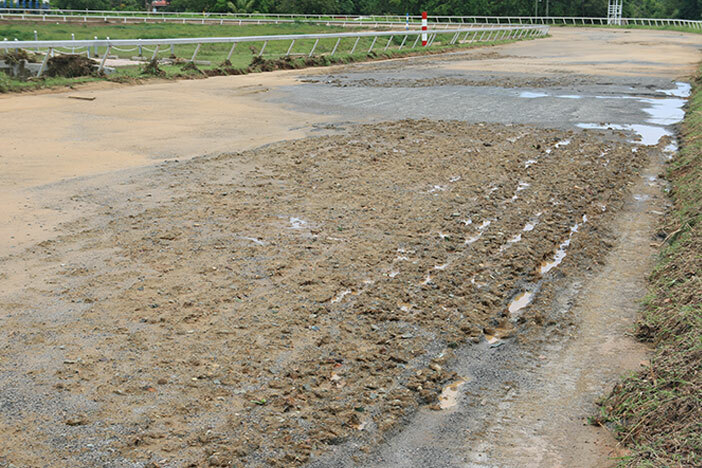 She said the track will need refilling because the surface is exposed in some areas and the sand is all gone.